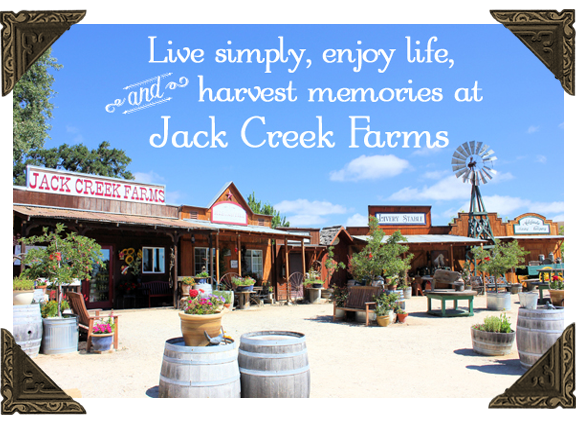 Jack Creek Farms is a small 5th generation family farm. Our farm is nestled in the coastal foothills of Central California 7 miles west of Templeton and Paso Robles. Our farm stand is located directly off of scenic Highway 46 West, in the heart of San Luis Obispo County wine country. We have RV and tour bus parking with easy highway access. Folks who visit our farm are invited to take a few moments to reconnect with simpler times past. Stroll through our gardens and antique farm equipment display. Depending upon the season, pick a sweet onion, blackberries or a basket of sun kissed vine ripe tomatoes. Discover long forgotten heirloom varieties of fruits and vegetables enjoyed many generations ago. Try your hand at throwing a lasso and rope "Bailey" our mascot roping steer. Kids will enjoy our fort maze, wooden train and tractor tire garden. Sit down in the shade and enjoy watching the numerous native birds that live on our farm. In the fall kids love our u-pick pumpkin patch. Sample apple cider slushees and pomegranate juice granitas. Browse our country store or visit with the farm animals. We are proud to be the oldest pumpkin farm in SLO County and the Central Coast. 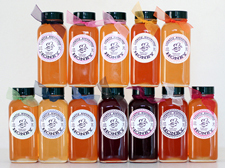 The local beehives have been "a buzz" with activity, and we offer many different varieties of honey for sampling. Local varieties of raw, natural unfiltered honey include (depending upon the harvest and season) toyon, yellow star thistle, wildflower, wild buckwheat, apple blossom, pomegranate, orange blossom, coastal sage, black button sage, safflower, raspberry, cotton, avocado, comb honey and more! It is amazing how honey can taste so different depending upon what the bees are pollinating. No infusions, flavors, syrups, or additives. Just 100% pure honey the way the bees made it in the hive. Tasting is free, and we are happy to share ideas and recipes for pairing and enjoying honey. 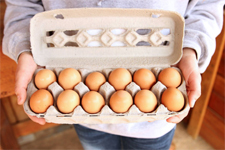 Check out the links to the left to learn about the many activities and products we have available from our farm's roadside stand. Our focus changes with the central coast seasons - Herbs & Veggies in the summer and Gourds & Pumpkins grown in our very own pumpkin patch in the fall. We offer u-pick for almost every crop we grow including blackberries, peaches, plums, apples, onions, tomatoes and pumpkins. With your support we hope to continue to supply our visitors and central coast community with fresh and wholesome fruits, vegetables, honey and eggs. By supporting small family farms, you have helped to not only preserve our rural character and cherished open space, you have also helped to preserve our family traditions and heritage. Best of all . . . harvest fun and take home a memory!